Our RV park is located in the Salinas Valley, which has several micro-climates with soil conditions ideally suited for growing grapes. 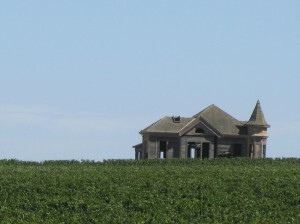 As the wine industry has grown in California, Monterey County has become a recognized wine region. Approximately 85 vintners and growers are now farming in the county, producing more than 40 varietals and a booming wine scene. Yanks RV Resort is a few minutes from the River Road Wine Trail and is an excellent base camp to visit each of the Monterey Wine Regions. Many of the wineries have public tasting rooms with seasonal hours. Visit the River Road Wine Trail web site, Or use the links below and at left to find an excellent wine country map and wine tasting planning tools. RV park customers can enjoy complimentary wine tastings at several nearby wineries, thanks to the special relationships we have established with local vintners. Ask for your wine tasting coupons at our office. Wine grapes were first introduced in the Salinas Valley by the Franciscan Friars over 200 years ago, as they settled in California. You can include a stop at a mission site while you visit the Monterey Wine Country. See more about the nearby California Missions here: here. The historic River Road Trail offers a sweeping view of the valley, weathered buildings, and a great variety of photo opportunities. Web page from the Monterey County growers association. Describes the wine growing areas, wine varieties, listings of tasting rooms and events. The site has an interactive map, and links to a mobile app to aid you in planning your visit. 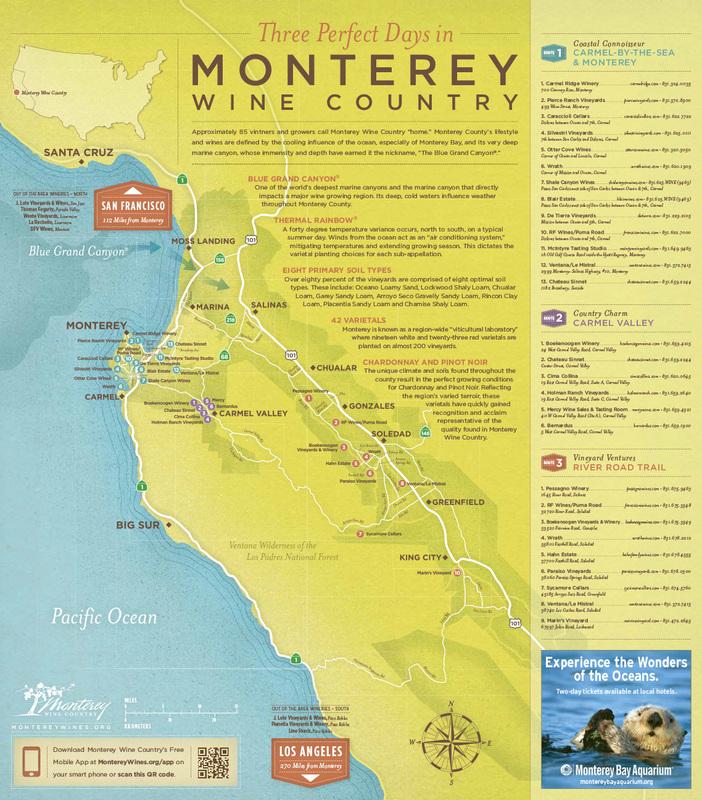 The official Monterey visitors site includes a page dedicated to the wine region, offering more information for visitors. Navigating Monterey County Wine Country is fairly easy. 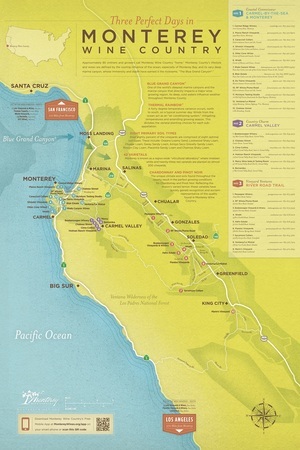 It’s essentially divided into three sections: The Carmel Valley, the Carmel-by-the-Sea Wine Walk, and the River Road Wine Trail. The River Road Trail is less than 10 minutes by car from our RV park entrance without even getting on a freeway. Ask our staff for directions, or download a wine country map (to the left) courtesy of the Monterey County Vintners & Growers Association.